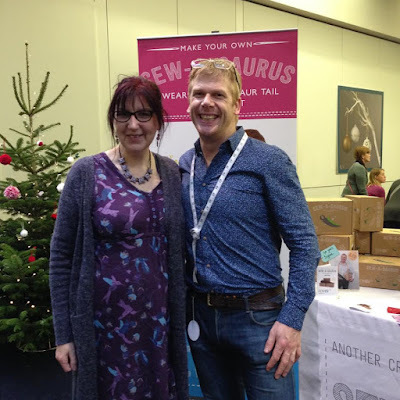 Kirstie Allsopp's Handmade Fair today. I didn't see Kirstie Allsopp, however I did meet Matt from The Great British Sewing Bee who was there with his lovely wife Gemma. They were promoting their Sew-A-Saurus. You should check out their blog, they've got some really good stuff on there. Here's the link: Sew What's New. They're a delightful couple, so very friendly and chatty and it was amazing to meet them. Here's me with Matt. Thank you to Gemma for taking the photo. and I wish them well in their business. at the Make & Take in the Cafe at Manchester Central. It's a Felt Fox Face Brooch and it's in kit form, you can make it with me in the Cafe, though if you're weary and all crafted out, you can take one home. The kit is at the special Mafia price of just £3. It's very easy to make and comes with complete instructions. It was fantastic to meet some lovely ladies today in the Cafe. Make & Taker's of the day and provided me with much food for thought. I can't wait to see the results of your "Fox Off"!!! Also to the two fab friendly ladies from Southport, who I had a lovely chat with at the end of the day. A special mention to Daisy, who was a delightful little girl. Thank you for chatting to me when I was all on my own and for showing me your Penguin. 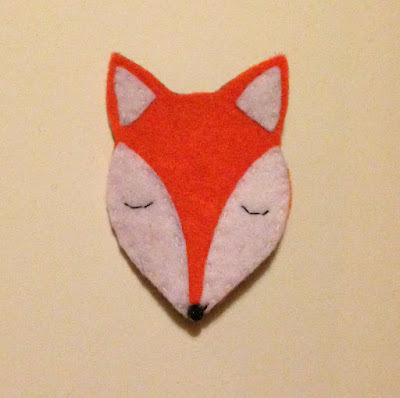 I hope you have fun making your little fox. and they let me take their photo for my blog. A big thank you to everyone I met today, especially those who bought my kits. It's very nerve wracking being on your own in that cafe and not everyone was as nice as you all were.